Author’s note: This post is cross posted on Justin Birckbichler’s blog too. In our respective 2015 reflection blog posts (Justin’s here and Mari’s here,) we noted that part of our resolutions was to continue to grow and look for new opportunities, and specifically mentioned a Top Secret Plan between the two of us. Consider this Phase 1 of the Top Secret Plan. #Teach20s is a new slowchat for teachers in their twenties. We will focus on the balance between growing into an adult, while thriving as a new teacher. Let’s face it, becoming an effective adult is just as daunting of a task as becoming a master teacher. Let’s build a community of openness, honesty, and collaboration to all help each other grow. Not in your twenties anymore? That’s perfectly fine too! #Teach20s members can benefit from advice on how you navigated through this time in your life. Teachers in their twenties need a solid mentor who will help them not only grow as a teacher, but also as a person. In our 2015 reflection posts, we also mentioned that we want to dedicate more time to our personal lives and improve our instructional practice. Starting a new Twitter chat seems like a direct contrast to this. We beg to differ. We are constructing a place where we can grow personally and professionally, and we are surrounding ourselves with individuals who will help us improve our instructional practice. Because we know how important time is to everyone, we are offering this as a slow chat. 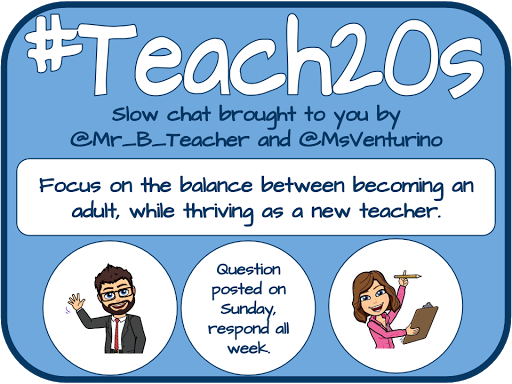 On Sunday morning, we will post the question (with the #teach20s hashtag) through our Twitter accounts (@Mr_B_Teacher and @MsVenturino) and the new @Teach_20s account. It will be a graphic and will be reposted a few times throughout the week. Whenever you get a chance, respond with the #Teach20s hashtag. We encourage you to respond to others and engage in meaningful conversation, as that will help us all to grow. Remember to set up a column for #teach20s in Tweetdeck to help track the chat easier. Establishing a new identity as an adult and navigating a new career of teaching can be a daunting experience. Let’s not do it alone; let’s help each other. If you have any suggestions or ideas for topics, feel free to leave a comment below.